Beatrice Sailor is a talented young Torres Strait Islander (full blood) who is singer/songwriter and dancer, born on Thursday Island, with Heritages and family also on Darnley and York Islands. Beatrice has also a background in mainland Aboriginal linked to Ku Ku Yalangi and Yidinji tribes in Lockhart River North Queensland. Beatrice was the Fourth of seven children, from the age of five her unties and uncles taught her traditional Torres Strait Islander song and dances, they also taught her to play piano, guitar and sing, Beatrice was touring by the age of twelve. Beatrice came to Sydney in 2001 to try her luck with the Redfern Dance Theatre where she successfully completed her studies in 2003. 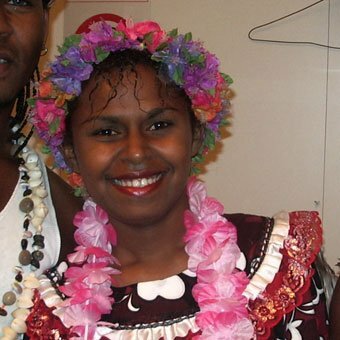 Beatrice joined Descendance in 2002 and proved to be an exceptional talent who did not need excess tutoring; she reveled in the mainland dancing and singing as easily as her native Torres Strait culture, Beatrice’s ability to sing was utilized on the Descendance CD “Didgeridoo Monde”, and Creation 2008, she also became a feature vocalist on The Sydney Dreaming Soundtrack in 2003. Tour of Sydney jails for NAIDOC week. Palm Island Australia teaching community children culture and coordinating a big Australia day Concert on the Island. Descendance at the Sydney Indigenous festival (July), Beatrice contributes with dancing in the traditional mainland show and contemporary shows. Performing with Descendance at the Aboriginal Tourism Expo at the Sydney Opera House. Performing with Descendance in the opening of The Rugby Union world cup before an estimated TV audience of almost one billion people. Performing at the Indigenous Sports Awards at the Sydney Convention Centre.